One of the most annoying things when you run a wallet for a given crypto currency for the first time is the waiting for it to download and synchronzie all of the blockchain. The older the crypto currency and the larger the blockchain is, the more time it takes to get in sync and in the case of Bitcoin a full blockchain download and synchronization can literally take days. But it is not only bitcoin, there are quite a few altcoins as well that are a few years old already and have big blockchains that can take some time as well, and while some coins offer blockchain archives you can download before running the wallet to speedup the synchronization they are actually not that many. CryptoChainer is a website that offers quick and easy access to downloads for many altcoin blockchains. Using these blockchain archives, your wallet will be synchronized quicker than it would normally take, tough it may still be a process taking quite some time. All you have to do is download the desired blockchain archive and extract it in the folder that the specific altcoin uses for blockchain storage data files. If you already have a working wallet or are restoring one from a backup, then you might have to do a resynchronization in order for your balance to appear correctly in the wallet GUI. 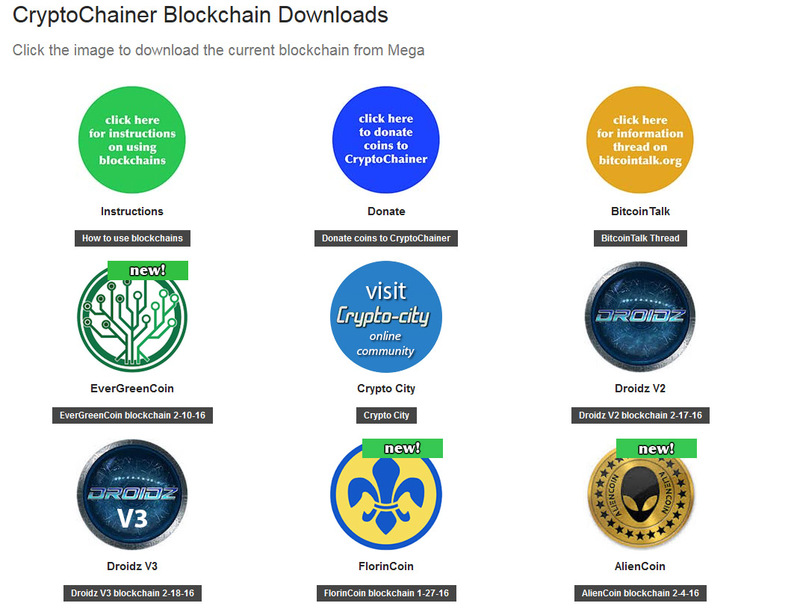 CryptoChainer currently has blockchain archives available for the following altcoins: 1337 Coin, 42 Coin, 8bit, AlienCoin, AnonCoin, ArchCoin, AudioCoin, Axiom, BBQ Coin, BetaCoin, BitBat, BitBay, Bitbean, BitcoinDark, BitcoinScrypt, BlackCoin, BlueCoin, Boolberry, Boolberry, Bottlecaps, BTCTalkCoin, CannabisCoin, CannaCoin, Cash, CasinoCoin, Chip, CLAM, CoinMagi XMG, ColossusCoin V2, ContinuumCoin, Crave, CrownCoin, CryptCoin, CryptoBullion, Cryptonite, Dash, Denarius, Diamond, Digibyte, DigiCube, DigitalCoin, DigitByte, DNotes, DogeCoin, DogeCoinDark, EarthCoin, Einsteinium, Emerald, EuropeCoin, EvergreenCoin, ExclusiveCoin, FeatherCoin, FedoraCoin TIPS, Fibre, Fibre, FireFlyCoin, FlutterCoin, FlyCoin, Franko, Franko, GameCredits, GeoCoin, GoldCoin, GoldPieces, Gulden, HamRadioCoin, HempCoin, HoboNickels, HTML5, Hyper, Hyper, HyperStake, IncaKoin, Influx, IsraCoin, JouleCoin, KittehCoin, LeafCoin, LGBTQoin, LiteCred, LycanCoin, MasterTraderCoin, Maza, MegaCoin, MinCoin, MintCoin, MMXVI, MonaCoin, MoonCoin, MurrayCoin, MyriadCoin, NavajoCoin, NetCoin, NeuCoin, Neutron, Neutron, NobleCoin, NovaCoin, NyanCoin, OK Cash, OKCash, Parallel, PayCON, Pennies, Philosopher Stone, Positron, PotCoin, Primecoin, Quark, Quatloo, Quotient, RateCoin, ReddCoin, RonPaulCoin, RubyCoin V2, SecretCoin, Sembro Token, SexCoin, Shadow, Sling, SmartCoin, Sprouts, Sprouts Extreme, StableCoin, StartCoin V2, Steps, SterlingCoin, Stress, Stronghands, SuperTurboStake, Sync, Synergy, Synergy, TagCoin, TekCoin, Terracoin, TruckCoin, TurboStake, UFOCoin, UltraCoin, UnbreakableCoin, Verge, VeriCoin, VertCoin, ViaCoin, Voxels, Warp, Warp, WhiteCoin v2, WildBeastCoin, WorldCoin, X-Coin, Xaurum, XCash, YellowCoin and ZiftrCoin.